Each full curriculum textbook offers comprehensive course contents for each grade level. 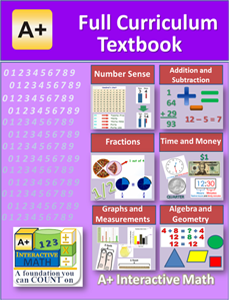 It makes learning math fun, easy and engaging with illustrations and easy to follow lessons. The math concepts are demonstrated with sample problems to ensure students fully understand how to apply concepts to real world math problems. Available in print format (B&W) or eBook format (PDF w/ colorful illustrations). Printed workbook to go with the curriculum textbook is recommended for a complete set with practice problems (worksheets) and chapter tests. See (textbook & workbook bundles) to SAVE on a complete set.